The first few days of any conference can be extremely overwhelming. The last conference I went to was a Gordon Research Conference - much smaller, and catered to a very specific audience. Almost by default, we were able to interact with celebrity professors on a very informal basis. Coming to a conference like this one, with thousands of people, can be a lot for a young graduate student. How do you really use a conference like this to network and build connections? As part of the ACS Travel Initiative, we had the pleasure of sitting down with Madeleine Jacobs for an hour and a half breakfast. She made an extremely good point while we were discussing personality types (she's a Meyers-Briggs ENTJ). You have to work against your predispositions. I'm an ENFJ, but definitely border on I/E - meaning I struggle between being an extrovert and being an introvert. In situations like this conference, I really have to make an effort to tap into my 'inner extrovert'. There are so many amazing people that if you don't take personal initiative, you'll miss a chance to have an amazing conversation. So far we have had the opportunity to meet with not only Madeleine Jacobs, but Peter Stang (ACS Editor) and Peter Goelitz (Angewante Editor). Both are incredibly outgoing and love talking with students. I have definitely found that for the most part, initiating a conversation is about as far as you have to go. Most professors are more than willing to talk with you, especially if you ask them questions about how they see the field developing, or what the role of our generation is in the future of academic research. Though these are professors whose names we see on published papers on almost a daily basis, and to us are celebrities in our fields, it's worth getting out of your comfort zone and introducing yourself. I've found so far that poster sessions make it extremely difficult to talk to people since there are so many people in small, crowded areas. The best places to talk are receptions. A lot of students tend to leave early or stay in groups amongst themselves, so the number of people decreases by a good bit. 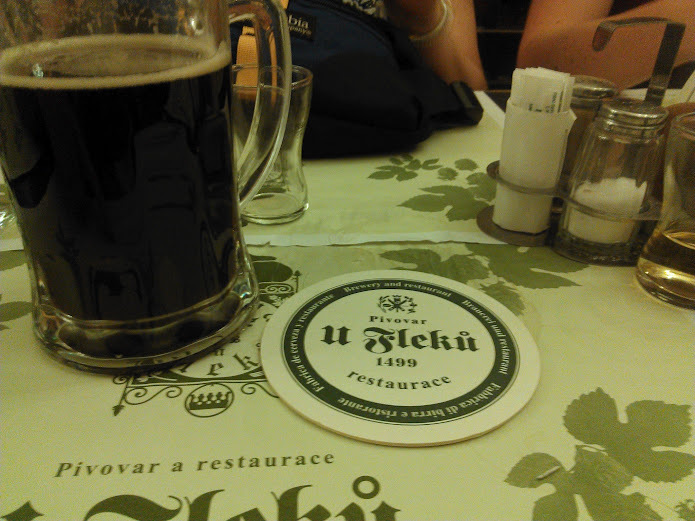 The best place to start a conversation is definitely in a more intimate environment, especially over good food and beer! 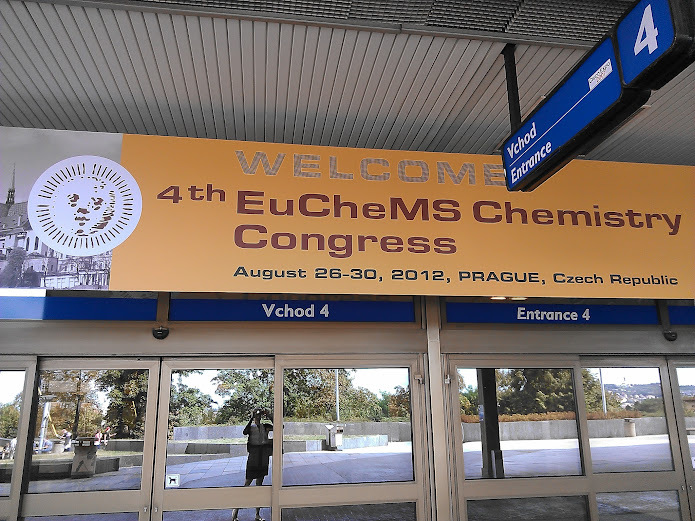 After leaving Chicago on Friday, and arriving jetlagged and exhausted into Prague (Cz: Praha; meaning "threshold") on Saturday, I expected to have a day or two before it was time to focus 100% on chemistry. I doubt it was planned (though I wouldn't put it past our fabulous American Chemical Society hosts to throw some extra chemistry in on our day off), but our tour of Prague early Sunday morning was full of a couple fun chemistry facts about the city and history of Prague. Looks like I can't go anywhere without a lesson in chemistry! One of the most amazing attractions in Prague is St. Vitus Cathedral (Czech: Katedrála svatého Víta), made primarily out of sandstone. 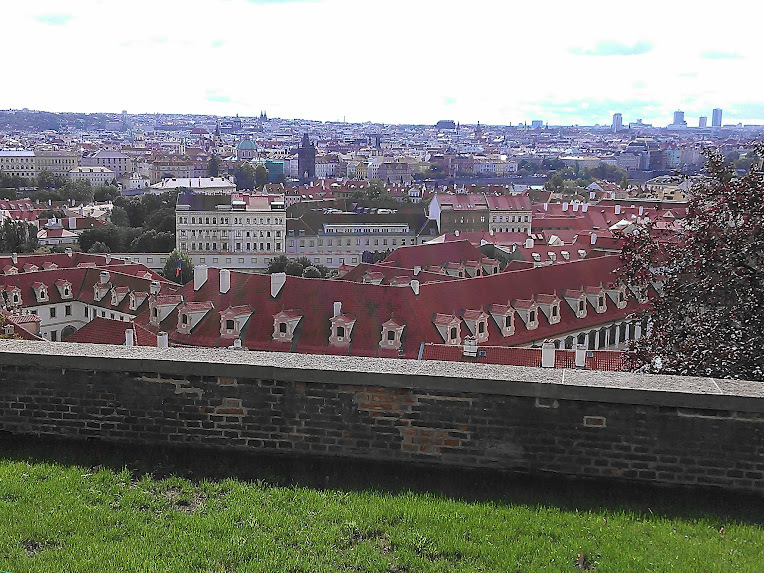 Construction began in 1344 and was not completed until almost 600 years later in 1929. 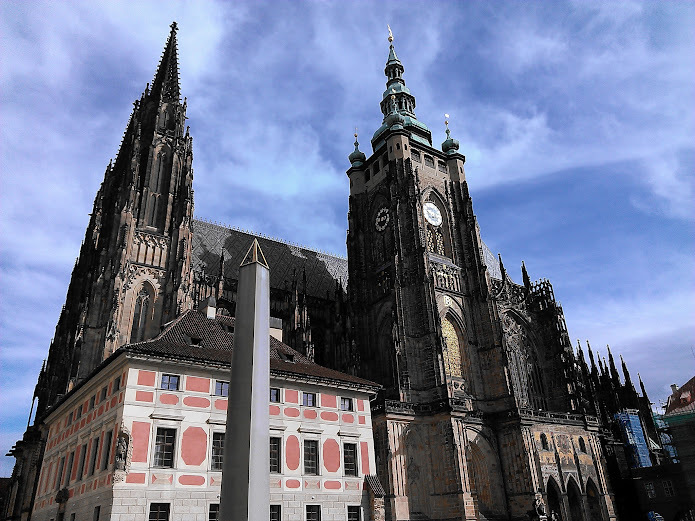 The Cathedral is inside of Prague castle, the oldest functional castle in the world. 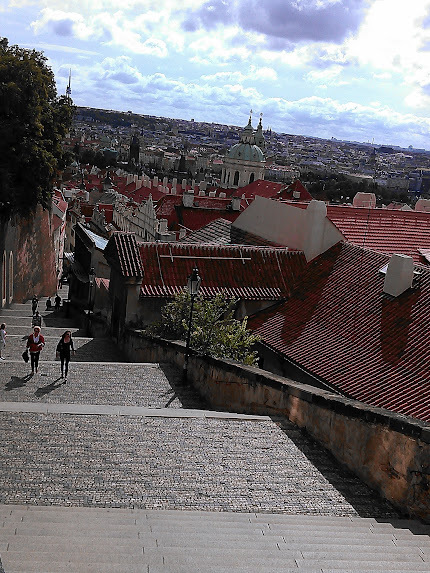 It's located in 'Castle Town', one of the four original towns that comprise modern day Prague (Castle Town, Little Town, Old Town, and New Town). The castle currently houses much of the Czech state department. The truly fitting part of the cathedral, however, is the chemistry behind the color gradient of its walls. Though this picture hardly does it justice, it's clear (if you look carefully) that parts of the outer walls are much darker than other sections of the cathedral (most specifically, the far right side of the picture). 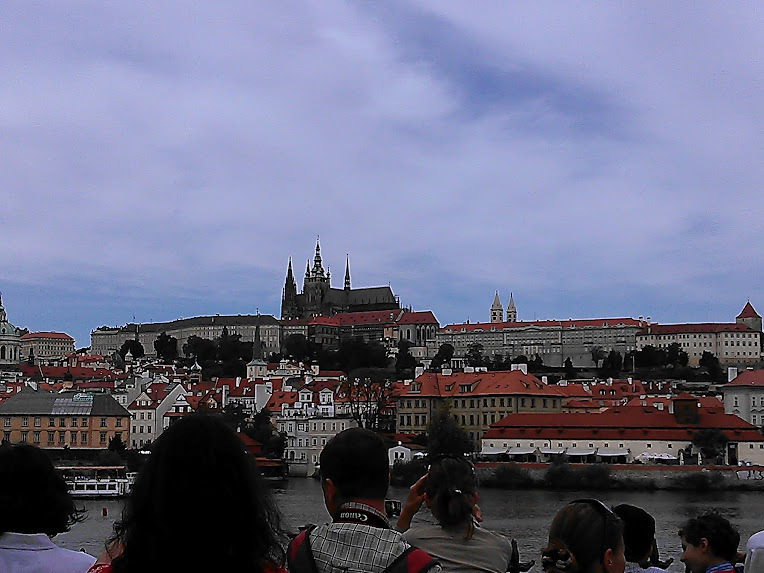 As the castle ages, the sandstone oxidizes and turns from a light tan color to a much darker, almost black. (Brownie points if you know what causes the oxidation!) It provides a really cool, visual way to tell which parts of the cathedral were built the earliest! Another really interesting chemistry fact (also oxidation chemistry, of course!) 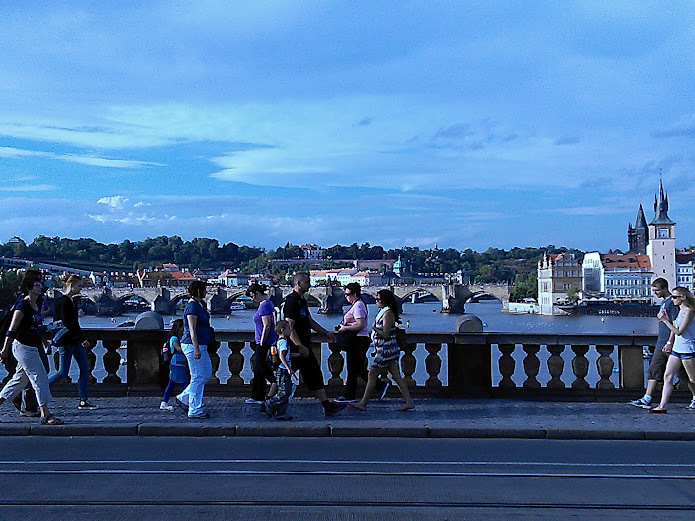 that stood out relates to the Charles Bridge which cross the Vltava River. All along the bridge are 30 statues of various saints and patron saints. Though wikipedia says that all 30 original statues have been removed and placed in museums, our tour guide mentioned that 3 of the originals still remain. While most of the statues are a dark brown color, the statue of St. John is green. Unlike the other statues which were made of Clay, the statue of St. John was made of bronze. As it ages, it oxidizes to what is commonly called 'Patina'. Even though I wasn't expecting a chemistry lesson during our first visit out in Prague, it definitely helped remind me why I came here in the first place! The next five days will be full of amazing lectures by some of Europe's (and the world's) most renowned chemists across all fields. I'm looking forward to some amazing talks and really gaining a better understanding of how Europe approaches the field of Chemistry.